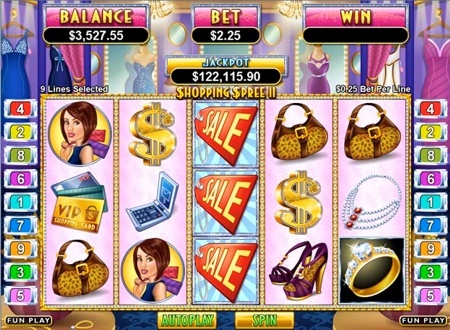 Shopping Spree II is an RTG progressive slot that follows on from the original Shopping Spree progressive game and has the same 5 reel, 9 line format. The jackpot however is completely different from the original slot and start at $100,000. The game has a fixed max bet of 9 coins and a fixed coin size of $0.25, so you have to play $2.25 per spin. The max bet of $2.25 per spin (rather then $11.25) and free spins make hitting the jackpot more likely. The wild Sale symbol only appear on the reel #3 and are stacked. This means you can get a whole reel of wilds with each wild multiplying any win by either X2... up to X20. X20 multiplier can also help you winning the progressive or seriously boost even the small wins on the paytable into big coin payoffs. Get 3 or more scattered Shopping Spree II logos anywhere on the screen to trigger 9 free spins. During the 9 free spins extra money symbols are added to the reels. These symbols can bring you bonus spins which are awarded at the end of the regular free spins. The money symbols are: 100, 200, 300, 400 or 500. Each one that appears adds to your "bonus tally". Once the free spins are over you are then awarded bonus spins. The amount of bonus spins you get depends on the amount of your Bonus Tally. You get 3 free games for every 1,000 points collected up to a maximum of 12 extra free games. During the bonus spins the whole middle reel stays wild. To win the progressive jackpot you need to line up 5 of the Diamond Ring symbols with the X20 wild multiplier on the reel #3. Without 20X multiplier you will by paid for this combination 5,000 coins or 5,000 coins multiplied by up to X10.